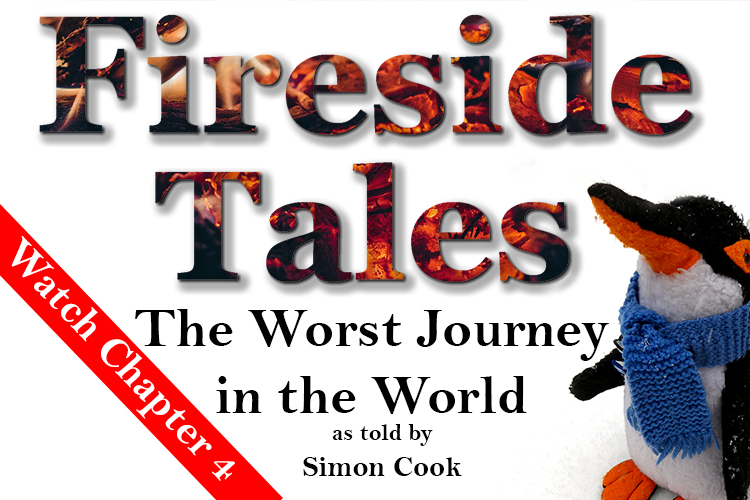 It’s time for the fourth part of Simon and Penguin’s Fireside Tales. If you haven’t seen the first three chapters, you can catch up in less than ten minutes. You can find chapter one here, chapter two here and chapter three here. As always, you can download the transcript with a glossary so you can follow as you listen. After you have watched the video, use the quiz to test your understanding. Chapter three concluded with biologist Edward Wilson and his two companions standing on the edge a huge crevasse. How can they get past in order to continue their journey to the Emperor Penguin colony? Watch chapter four to find out. 2. Why were the penguins standing close together? 3. Why did the explorers give up on their first attempt to reach the colony? 4. Why do the penguins keep their eggs on their feet? 5. The male penguins do not eat for two months as they incubate the eggs. Do you want to know how the journey continues? Come back next month for chapter five. This is the third of Louise‘s Human Resources vocabulary mind maps. The first one focused on people and places and the second on strategy and policy. This one is all about employee relations. You can see the mind map on Popplet or download a pdf. Once you have studied the mind map, you can test yourself with the activity in the second part of this blog post. How well do you know the words in the mindmap. Test yourself with this activity. The answers are at the end of this blog post. Don’t forget you can use a dictionary to help you. The Cambridge English Dictionary has a special business English section. Choose the correct word/phrase to complete each sentence. 1. The ___________ are everyone who has an interest in the company. That includes ___________ , shareholders and customers. 3. Talks ended in ___________ again today, so the union has asked for arbitration. 4. Some companies have ___________ to help improve communication between management and the workforce. 5. We have a ___________ in our company. That means everyone has to join the union. 7. ___________ is what some people call workers who cross a picket line to go to work. 8. If you arrive late again, you’ll get a ___________ because you’ve already had a verbal reprimand. 10. There’s been a change in the ___________ , so we need to make sure we comply with it. 1. The stakeholders are everyone who has an interest in the company. That includes staff, shareholders and customers. 3. Talks ended in deadlock again today, so the union has asked for arbitration. 4. Some companies have works councils to help improve communication between management and the workforce. 5. We have a closed shop in our company. That means everyone has to join the union. 7. Blackleg is what some people call workers who cross a picket line to go to work. 8. If you arrive late again, you’ll get a written warning because you’ve already had a verbal reprimand. 10. There’s been a change in the employment law, so we need to make sure we comply with it. Did you find this useful? Download a pdf of the mind map. If you can’t wait until then, check the website again soon for extra activities using the words from this mind map. There are lots more mind maps on the Stratford Teachers blog. If you have any questions about the mind map, leave a comment below. Do you need to develop your business English vocabulary? Send us a message. We are halfway through Simon and Penguin’s Fireside Tales. That means we have arrived at chapter three. Have you seen the first two chapters? If you haven’t, why not watch them now; they are only three minutes long. You can find chapter one here and chapter two here. At the end of chapter two, we left biologist Edward Wilson and his two companions shivering in their tent trying to decide whether or not to continue their journey. Watch chapter three to find out what happened next. 1. Why did the explorers have to stop so often? 2. Why did Garrard have problems with his vision? 3. How many hours did they travel each day? 4. In a blizzard, what happened to the temperature? 5. The explorers slept well during the journey. Do you want to know how the journey continues? Come back next month for chapter four. It’s time for chapter two of Fireside Tales. If you missed chapter one, you can catch up here. Don’t forget, you can also download the transcript with a glossary so you can follow as you listen. After you have watched the video, use the quiz to test your understanding. In chapter one, we learned the background to the ‘worst journey in the world’. In chapter two, Simon and Penguin begin the story of how the three explorers walked across Antarctica in the winter of 1911. 1. When do emperor penguins lay their eggs? 2. Why did Dr Wilson decide to walk to the penguin colony? 3. Why did Dr Wilson take two companions on the trip? 4. Which one of these sources of light did they not have during the trip? 5. The explorers were optimistic about reaching the penguin colony. Do you want to know how the story continues? Come back next month for chapter three. Here is the second of Louise‘s Human Resources vocabulary mind maps. The first one focused on people and places. This one is all about the vocabulary of strategy and policy. 1. The ___________ in our company needs improving. It’s really difficult to share information. 2. HR wants to improve ___________ with more team building! 3. The ___________ have gone up because of the success in Europe. 4. Our latest ___________ campaign involves creating support networks for women because they are under-represented in managerial roles. 5. Due to the merger, some roles are duplicated so there will have to be ___________ . 6. When people are made redundant, good employers provide ___________ services which help people find new jobs. 7. The company wants to offer a more flexible career path so it is advertising ___________ to encourage movement between countries. 8. Some companies use ___________ to find new solutions to problems. 1. The knowledge management in our company needs improving. It’s really difficult to share information. 2. HR wants to improve staff retention with more team building! 3. The workforce levels have gone up because of the success in Europe. 4. Our latest equal opportunities campaign involves creating support networks for women because they are under-represented in managerial roles. 5. Due to the merger, some roles are duplicated so there will have to be redeployments. 6. When people are made redundant, good employers provide outplacement services which help people find new jobs. 7. The company wants to offer a more flexible career path so it is advertising transfers to encourage movement between countries. 8. Some companies use suggestion schemes to find new solutions to problems. When we published our first Human Resources mind map, we also promised an extra activity to help you test yourself and learn the words. Click on the image below to open the interactive exercise. See if you can classify the words correctly. You can read the first blog about the People and Places mind map here. If you have any questions about the mind map or this learning activity, leave a comment below.